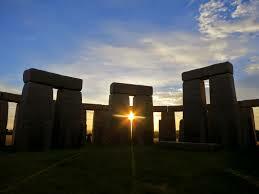 Summer officially begins with the Summer Solstice on June 21, the longest day and shortest night of the year. The Summer Solstice can be a very powerful and magickal time, the time when all that light and warmth can be used to bring clarity and strength to your endeavors. As the sun is honored and celebrated in all of its glory, it also provides the opportunity to incorporate some solar magick into your life. The Solstice can be a good time to take stock of where you are in relationship to your goals and plans for the year. Just as the sun dispels shadows, think of the sun helping to shed light and bring clarity and focus to your thinking. Ask yourself if you are on track to achieving your goals for the year or if you need to regroup and refocus to get back on track. As you look back on what you have accomplished so far this year and prepare to turn your attention to what you still want to achieve, you can partner with the energy of the Solstice to give your intentions a serious, solar-powered boost. There are many options for solar magick. To give your crystals an energetic charge, place them where they will get direct sunlight on the day of the solstice and leave them there all day long with the intention that they will be energized by the rays of the Solstice sun. Crystals that resonate strongly with the sun are sunstone, citrine, orange and honey calcite and carnelian. Take a candle outside and hold it up to the sun, visualizing the light, heat and energy empowering the candle. As you hold the candle up to the sun, speak out loud the type of blessings you seek, such as joy, strength, protection or any other solar quality. If you like, briefly light the candle and then snuff it out. Save the candle for a time when you are feeling depressed or tired, perhaps next winter, and then light it with the intention of rekindling your passion and fire. Orange, red and yellow candles are particularly appropriate for this kind of work. Keep in mind that any intentions you are setting or work you are doing involving empowerment, protection or seeing things clearly can be bolstered by finding a way to incorporate working with the Solstice sun. If you have the opportunity, go outside at midday and thank the sun for the light and warmth it provides and then voice out loud the intentions that you would like to see bolstered by the energetic assistance of the sun. The Solstice is also considered to be an ideal time for working with animals and fairies. As Mother Nature reveals herself in her lush and beautiful summer finery, remember to take the time to honor and appreciate the natural world around you.